It took me a while to find one, but I did. 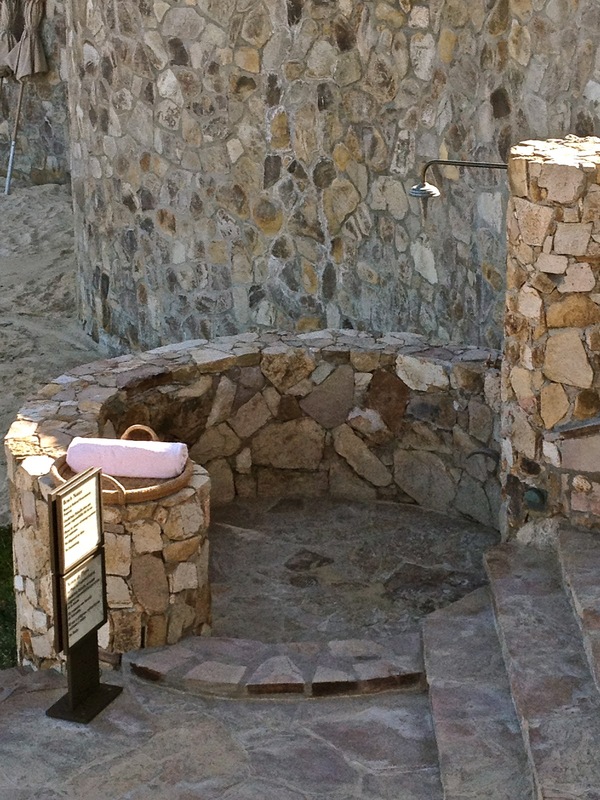 An outside shower at Palmilla. Located at the bottom of the stairs, right on the beach. Add this to the collection of plein air showers from yesterday's post! It is with great sadness that we are leaving today. It has been the most relaxing vacation ever! That one is perfect and is going in my inspiration file! Great find! Beautiful! I never look forward to the end of a vacation, but as soon as I get home I am sooo happy to be there! woww great post good luck..
We are putting in a new master suite shower and I plan on a WATERFALL! I already have lots of stonework that looks like this IN THE BATHROOM! I LOVE showers with character. My guests always ask if they can USE THE SHOWERS,hehe! I guess that's a compliment! We also plan on putting one of these in, BUT it's a little trickier in New England...This one is PERFECT! Furniture In The Bathroom: A Luxury!